I'm the Next Top Chef. You Heard it Here First. 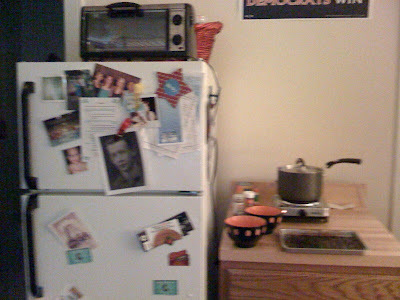 As I've mentioned before, my small apartment is kitchenless. The folks over at my realty company have labeled it a "bachelor studio," which I suppose they think makes it sound jazzy & fun. This is, I regret to tell you, not really the case - it's essentially a dorm room, with all the not-so-comfortable comforts of one except that I'm roommate-free & don't have to use a communal shower. My kitchen-free lifestyle has led, as you can imagine, to much dining out on my part. I'm on a personal mission to find the best chicken kaprow in the tri-state region, so I chow on a lot of Thai, & the folks at the new Submarina in Dupont Circle practically know me by name because I buy their chili three times a week for lunch. Healthy? Doubtful. Cheap? Hardly. But until now, save for making sandwiches every meal of every day, I didn't have tons of options. 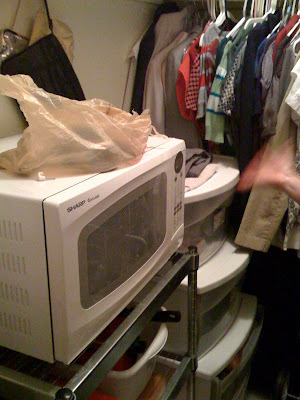 Yeah, my microwave is in my closet. What of it? And don't even ask where I drain my pasta. I don't have a kitchen sink & I don't wanna get noodles caught in the bathroom sink, so... well, you can imagine where that leaves me to do my draining! Needless to say, it's probably a safe bet to assume that even with my newfound kitchen wares, I won't be doing much entertaining. I can't cook at all but the idea of not having a kitchen terrifies me! Haha don't burn your clothes!